The Padilla Family has run the Spokane Highland Games Kid’s Games for over ten years. The events in the Kid’s Games are kid-ified versions of the events in the adult games, so that children get a hands-on introduction to the Scottish highland athletics. Instead of Putting the Stone, children Put the Scone by standing behind a rope line and lobbing a tartan-wrapped round of bread as far as they can. Instead of a Hammer Throw, it’s a Haggis Throw, an event in which children hurl a wrapped sausage into cast iron pots set progressively further and further from a rope line. Other events include the Sheep Toss (equivalent to the Sheaf Toss), a Tug-o-War and a Sack Race. 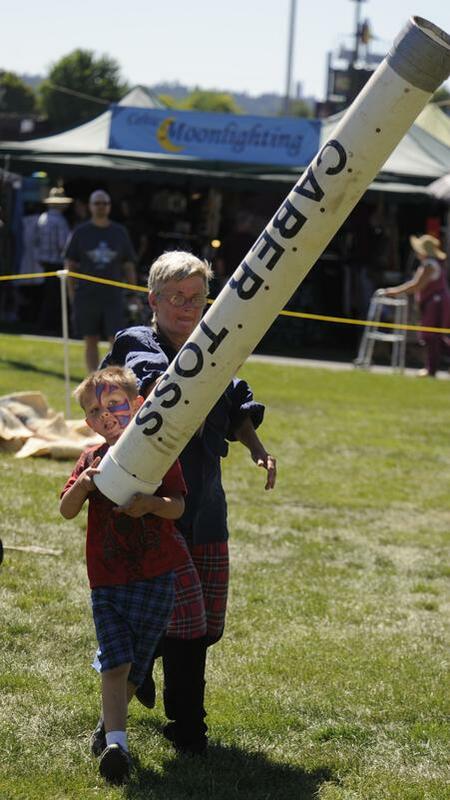 The Kid's Games culminates with the most well-known Scottish highland athletic event, the Caber Toss; here children take large poles of PVC piping of various lengths and try to tip them over onto the ground to achieve that perfect 12 o’clock score. Medals are awarded for first, second and third places by age group for each event. Of course, all ages are welcome; no one is ever turned away. Practice runs all day and the Kid’s Games start in the afternoon, so children can work out any jitters before they compete. This also accommodates children who won’t be around in the afternoon to compete; they still get to know what it feels like to participate in the events.